Hello stamping friend! Every quarter, at least, my team and I get together to talk about what’s new, what’s happening; making plans for the upcoming quarter, etc. Of course, every team meeting equals stamping!! After all – that’s what brought us together – our love of stamping, and Stampin’ Up! products. It’s also the best way for everyone to try out new products and techniques. Last week, some of us got together (so sorry you weren’t feeling well, Lynn!) and I brought out the new Carols of Christmas stamp set, the Card Front Builder Thinlits and the Embossing Paste. I was thrilled that it was the first time for the others using the Embossing Paste. I’m a HUGE fan of it, as I’m sure you’ve noticed, and I really wanted everyone to see how easy and fun it is to use. Using the white Embossing Paste on the Tranquil Tide background gives the paste a bit of a ‘green tinge’ to it! Starting with a panel of Tranquil Tide cardstock, we laid the Pattern Party Decorative Mask on top. With the Palette Knife, the Embossing Paste is spread across the top left and bottom right corners of the cardstock. Lift off the Mask, and set the panel aside to dry. (It only takes a few minutes to dry). DEMO TIP: Be sure to clean off your Mask and Palette Knife right away – or at least put them into a basin of water. Otherwise, you’ll be spending precious stamping time cleaning off your tools! Ink the sentiment from the Carols of Christmas stamp set in Real Red ink, and stamp onto Whisper White cardstock. Use the Stitched Shapes Framelits to die cut. Next, stamp the ornaments image (either one of the two – your preference!) in Lemon Lime Twist ink onto Whisper White cardstock. The Card Front Builder Thinlits are used to die cut the ornaments, as well as the trees from Lemon Lime Twist Cardstock. By the time you’re finished stamping & die cutting, your embossed panel will be dry! 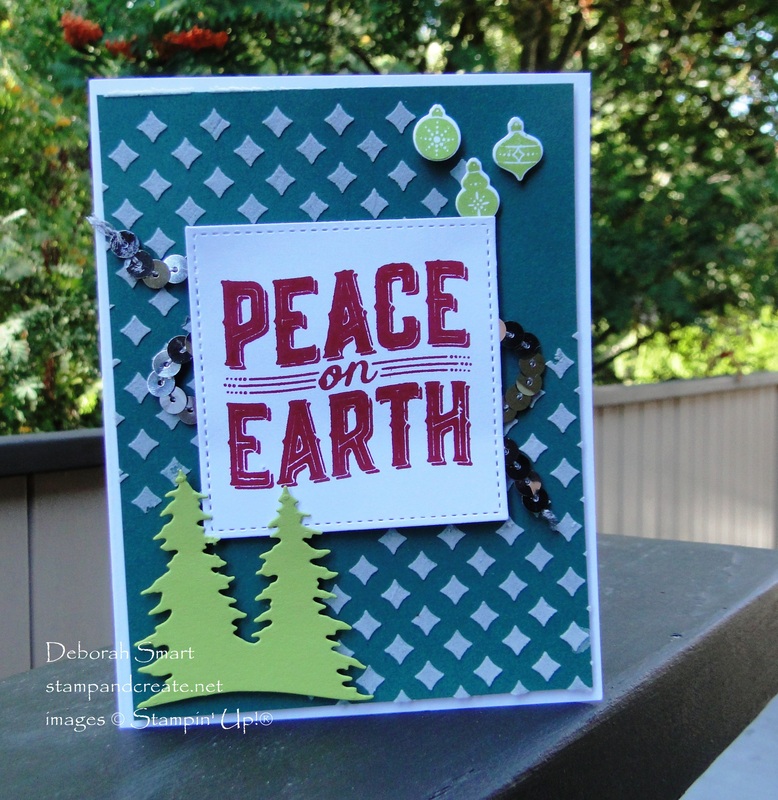 Attach the panel to a Thick Whisper White cardstock card base with Stampin’ Dimensionals. Turn the sentiment panel over, and loop a length of Sequin Trim in Silver back & forth, leaving some loops overhanging on each edge. I use the Tear and Tape to hold it in place. Finally, attach the sentiment, trees and ornaments to the front panel with Stampin’ Dimensionals. I like that the Tranquil Tide and Lemon Lime Twist, paired with the Real Red, are a nice twist on the ‘classic’ red & green for Christmas. Everyone was surprised, and very pleased, at how easy the Embossing Paste is to use. It’s just like spreading butter on toast! 🙂 There’s other ways to use it as well; I love versatility in our products! To achieve different looks, the Embossing Paste can be coloured with our Ink Refills, or place the stencil back on top once dried, and add colour with a Sponge or Sponge Dauber. You can also add Embossing Powder on top of the paste while it’s still wet, and use the Heat Tool to set it. If you’d like to join my team for some fun stamping get togethers, it’s easy to do! Whether you’re interested in starting your home based business, or simply joining as a ‘hobby’, we’re ready to welcome you! Click THIS LINK to join now, or email me at debsmart@shaw.ca if you’d like to talk more about the opportunity. 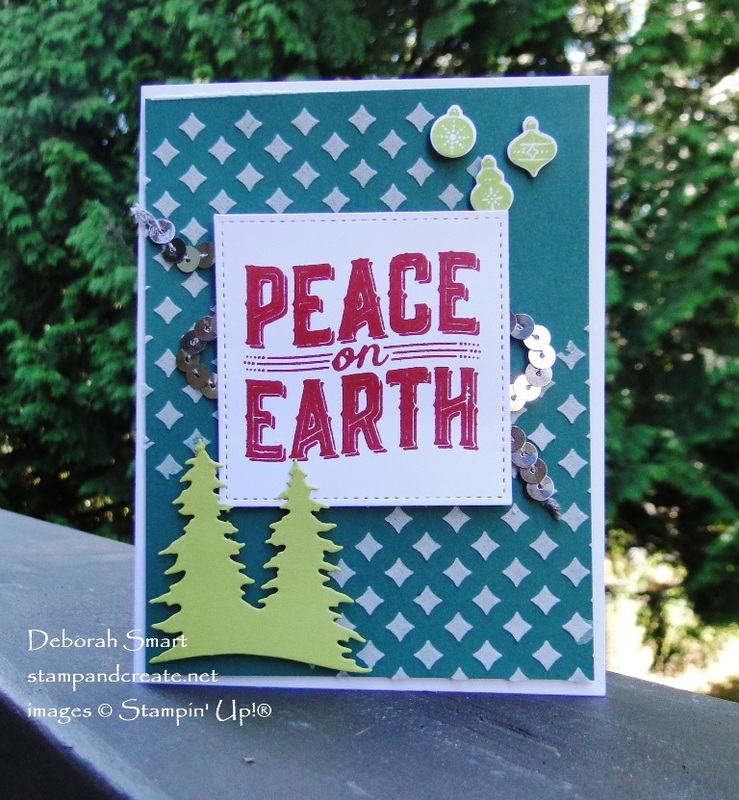 I’ll be back to share more tips & looks with the Carols of Christmas stamp set and the Embossing Paste! To create your own card, click on the images below to order the supplies from my online store. I love the background you made on this card, Deborah. You are such an inspiration to me!